Thanos is the best final boss, who’d have guessed it? Ever wanted to play an MCU video game? Me too. 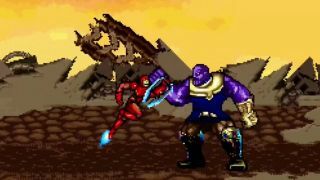 For now, though, the next best thing is this simply incredible 16-bit recreation of one of the best fight scenes from Avengers: Infinity War. It’s pixel-perfect, right down to the awkward screen-scrolling and minimalist text boxes – and deserves to be watched in all of its glory. This comes courtesy of YouTube/all-round genius Mr. Sunday Movies. Not only does he give us a full retro re-telling of Thanos’ near-defeat on Titan (thanks, Star Lord), but there’s also a small peek behind the curtain on just how the 16-bit fight scene compares to its live-action/CGI original. My favourite bit? It has to be the subtle shift in the soundtrack when Star-Lord confronts Thanos upon – spoiler! - hearing of Gamora’s death. It’s surprisingly evocative and really hammers home the tragic downfall of our beloved heroes. But that’s not even half of it. We’ve witnessed similar 8-bit and 16-bit remakes of classic movies before, but this goes above and beyond. It’s such a perfect love letter to both the MCU and the SNES era of gaming that it’s hard to really see anyone else topping this anytime soon. And whisper it, but it might just be better than the actual movie in terms of sheer spectacle. Everything seems so slick, and the stylised design really makes some of Earth’s Mightiest Heroes, especially Peter Parker and his Iron-Spider suit pop. Though it does make me wonder what the hell Drax and Iron Man were doing for half the fight…?